Expect lavish luxury at this beachside, 5-room, romantic riverfront inn with sandy beach access on the Atlantic Ocean, plus pool with scenic views of the Indian River and Jack Island State Preserve. All rooms feature private entrances, in-room shower or bath/shower, free local calls phone, remote TV with free movie channels, refrigerator, coffee maker, sitting area, queen or king bed and quiet, guest-controlled central air-conditioning. Just 90 minutes from Orlando or West Palm Beach and 3 hours from Jacksonville or St. Augustine. Hiking, biking trails, tennis, golf, jai-alai, horseback riding on the beach, museums, oceanographic institution, manatee watching, near shore shipwrecks, antiquing, mall shopping, theater, skydiving, deep sea fishing and more attractions are nearby. Completely non-smoking facility, both inside and outside of rooms. 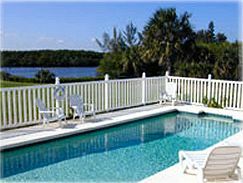 Recommended by FLAUSA as one of the most romantic inns in the State of Florida and featured in Frommer's Florida Travel Guides.